SK-60, ingeniously simple in layout and easy to operate the machine of the Canadian inventor Joseph-Armand Bombardier, pushed the world to the greatest snowmobile boom. It not only expanded the snowmobile market, but also created a new kind of winter sports and recreation. There was a whole industry, including the production of special clothes and footwear, outfits. 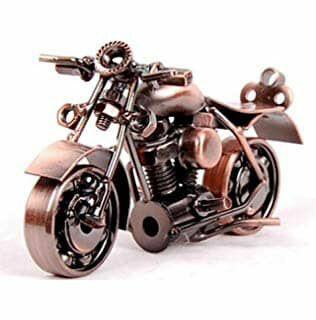 It is clear that the boom happened not in one moment, for some time "the flame ignited from the spark". The company Polaris, which produced snowmobiles in the USA, did not immediately recognize the wind of changes and continued to produce low-speed and heavy rear-engine vehicles. By the way, often Polaris dealers claim that it was their company who invented the snowmobile, since it happened in 1956, that is before Bombardier. So it is, only the first snowmobile of the founders of Polaris (which at the time was farming equipment) David Johnson and the brothers Edgar and Alan Hittens was, in fact, a copy of the rear-engine toboggan Eleyson FWD model K-12. And the cars of the first years, sold in Canada, had the Autotobbogan brand. Support skis were the length of the whole snowmobile, taxiing was carried out by the automobile "steering wheel", behind was the motor Kohler. Machines with steel plumage were painted in bright red color, in the emblem of the company there was also a red five-pointed star. In the back of some models was located the helm - with its help the position of the caterpillar relative to the runners changed depending on the density of the snow. Metal racks of the wind shield allowed to mount a lightweight collapsible roof and side walls. The last and most powerful "Polaris" snowmobile rear-engine configuration was the Mountaineer KE-24-D (1964) with a 24-horsepower two-cylinder Kohler engine. "Mountaineer" could take on board three people (the driver - in front, the passengers - from behind with shoulder to shoulder), drag up to two tons of cargo and storm the rises to 45 degrees. Curious and other features of this "dinosaur": the steering wheel with an amplifier, reverse gear, automatic V-belt variator, spring suspension of steel skis and two caterpillars. 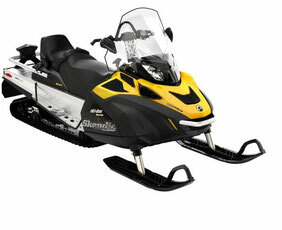 By the way, the total width of the latter is 860 mm, that is, much larger than the most passable modern snowmobiles. But also cost Mountaineer for those times a lot - $ 3350 (for comparison: SK-60 was sold for $ 990). 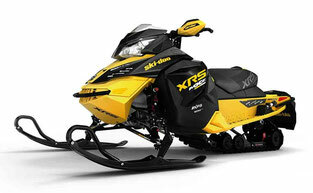 SKI-DOO Snowmobile Manuals PDF are above the page. In 1962, another US company, Arctic Cat, entered the US snowmobile market. The first models of the "Arctic cats" of 1962-1963 adopted a classic rear-engine scheme for that time, with a gasoline tank as the back of the driver's seat (by the way, the driver and passenger could sit side by side), an automobile rudder and a high windshield with panoramic glass. The caterpillar was rigidly fastened to the tubular frame. There were also innovations: there were no skis along the hull, and the front skis were combined with ... small wheels. Actually, the wheels could be installed instead of skis - and it turned out a kind of ATV (that's when, apparently, the firm and felt the craving for these machines). A similar design was practiced in 1965 by Polaris, but it did not receive any further development.